Finished the BACK TO THE FUTURE trilogy last night. It’s the first time I watched an entire movie trilogy while in a tent. I’m not sure if that means anything. Actually, I’m sure it means nothing. I watched BACK TO THE FUTURE PART III (1990) on 8.24.14. It was, probably, my sixth or seventh viewing of the film. But it was my first in a decade. 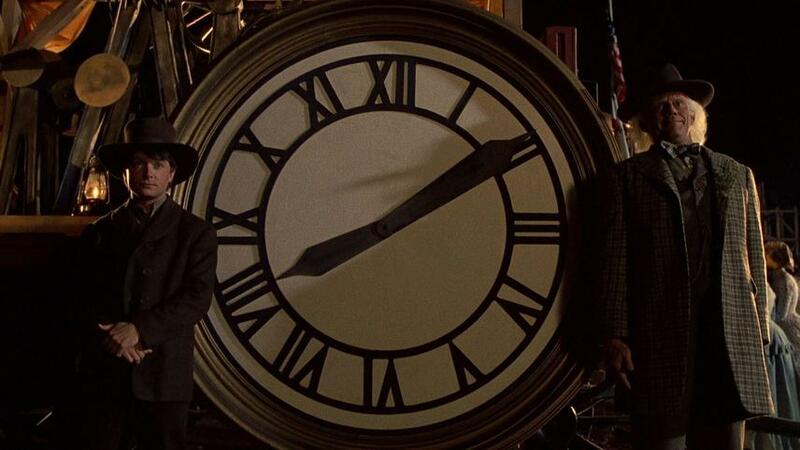 BACK TO THE FUTURE PART III is a unique situation wherein a trilogy changes its genre for the third film. Like the first two films, this is an action/comedy/sci-fi movie. The third movie transports Doc Brown (Christopher Lloyd) and Marty McFly (Michael J. Fox) back to 1885. Doc Brown takes on the role of a blacksmith for many months before McFly is able to join him. This is a fish out of water story which works better than the futuristic setting of BACK TO THE FUTURE PART II. The villain of this movie has Buford ‘Mad Dog’ Tannen (Thomas F. Wilson), an ancestor of series stalwart Biff, first threatening Doc, and then challenging Marty. Marty is trying to get back home, but has an appointment for a duel with Mad Dog for the same time. Things are jumbled because Doc falls in love with Clara (Mary Steenburgen) while Marty still can’t stand being called ‘chicken’ or ‘yellow’. Where the second film stalled due to an over-reliance on the standard jokes set by the first film, this final installment of a trilogy feels like it is having more fun with the concept while also breaking its own ground. Jokes about manure might be the same, but the gag about a Tanner calling out a McFly is given a bit of a twist when Tanner calls out the wrong guy. Marty saying “Great Scott!” while Doc responds with “Heavy!” is funnier than it should be. Just playing that little bit with everything the previous movies set up really works. This is not a classic in line with the first. The joke about Marty calling himself Clint Eastwood gets slightly old, even if it pays off with an homage to A FISTFUL OF DOLLARS. It is in moments like that homage, though, where the movie is working a little too hard to be a wink at modern culture rather than just being really new and good. The fitting in of Lea Thompson as a McFly also seems a little odd, considering that the original character she played married into the family. It could be said that all McFly descendants go for the same sort of girl, but that would be to forgive a bit of gimmic casting which doesn’t really work. Even having Michael J. Fox also play his descendant, Seamus McFly, feels like forcing the one thing that worked about the second movie into this installment. That can be forgiven, somewhat, by the fact that Fox does a nice job as Seamus and that the movie does a pretty good job of keeping that side story small. The climax of this film is still exciting. Sure, it stretches time and speed to an absurd degree when Clara and Doc are trying to get off the train and into the DeLorean, but then this is a movie about time travel. One can’t be too choosy about which nits he picks. This is a movie which is not quite as good as the first, but which improves on the second. You can’t really watch this one without watching the other two, but you can at least rewatch this series knowing that it pays off well in the end. ~ by johnlink00 on August 25, 2014.